For long-term experiments in tropical restoration ecology, we bought a 63 acre cattle farm in Costa Rica in 1992. It was typical of those in an advanced state of degradation from erosion. After months of searching for the best worst land for our restoration goals in southern Costa Rica, Project Director Lynn Carpenter and her Tico friends discovered a 63 acre farm, Finca Cantarrana ("Singing Frog Farm"), in August 1992. The blue star on the map at the right shows its location. We wanted land in an advanced stage of degradation because more and more farmland in the tropics will erode to that state in the decades to come. We wanted our results to apply to similar conditions in the future. Costa Rica allows foreigners to purchase land, so we bought rather than leasing, giving us complete control over our property throughout our long-term experiments. Finca Cantarrana is located 450 meters southwest of Italcancori, Costa Rica, indicated on the Google Map. Its coordinates are 8.7 degrees N and 82.9 degrees W. See the satellite photo at right. The outline of the farm is indicated in yellow. The terrain is rugged and steep, varying in elevation from 1015-1070m (3300-3500’). Located on the south Pacific slope east of the high Talamanca Mountain range, the farm intercepts heavy fog fairly frequently. Yearly rainfall averages 4400mm (almost 15 feet! ), which falls mostly between April and December with peaks in May and October. Unlike in the Temperate Zone, in the Tropics temperatures differ more between night and day than between seasons over the year. Monthly temperatures typically average around 70F (20C) at our site. At our elevation nights cool to the 60s whereas days rarely exceed the 80s and are usually cooler because of cloud cover. 1994: Our newly-built field station is on the high ridge, upper right. Photo by David Beattie. The natural ecosystem before deforestation consisted of foothill rainforest. A river, Rio Cantarrana, crosses the north end of the farm. Toward the south, the land rises to a steep ridge and then falls into a large bowl-shaped formation we call the amphitheater with springs that drain into a small lake near the southern edge of the property. Much of the region was still natural forest after World War II 1945. During the 1950s and 1960s settlers cleared the forest and converted the land to coffee plantations. By 1978 most of the farm was converted to pasture by removing the coffee and planting various pasture grasses. At that time, a small steep gorge in the north end of the farm was fenced off and abandoned. 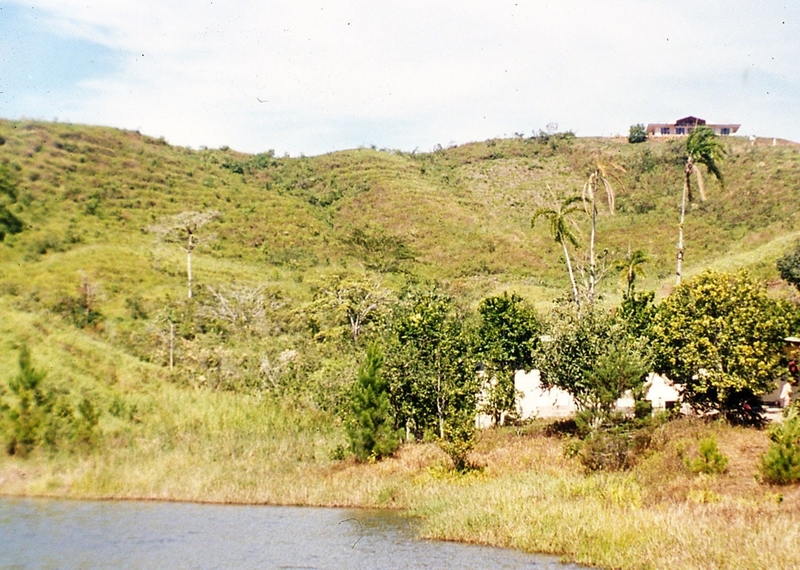 Subsequently secondary forest regenerated that now is over three decades old. This small area has the best soil on the farm. Clearly overgrazed and eroding for over a decade, by the 1990s when we bought it, the land produced beef at half the production rate of the 1970s. Deep cattle trails up to 6 feet deep crisscrossed the slopes, laying bare about half of the land surface. Initially the farm had little infrastructure. A terrible steep rock road served the community. Although the countryside had electricity, neighbors got their water from wells and streams that were sometimes contaminated so parasitic infections were common. In 1993 we built a structure on the farm to double as a farm house and scientific field station and established our first tree nursery. The next year we helped the community bring in piped purified water, improving the health of residents. Soon after, the government paved the main road. In subsequent years we have built a storage shed, caretaker’s cottage, greenhouses, and a new nursery. We continued to graze cattle, only fencing off plots to be used in experiments. Therefore, the remainder of the land not under experiments has continued to erode, giving us typical degraded conditions at the beginning of each new experiment. In 1995 agronomists at the University of Costa Rica classified our soils formally as various forms of Ultisols. Agronomists consider these soils to be one of the most infertile of the 12 soil orders because they are old, their nutrients have leached away, they are acidic, and they contain toxic forms of aluminum. The rainy tropics typically have Ultisols or Oxisols, so our farm is typical of vast tropical regions worldwide. Because Ultisols contain little organic matter and most mineral nutrients are scarce, their colors are dominated by the high levels of iron and aluminum that remain after leaching. Therefore, they are typically colored reddish or yellowish by the oxides of those metals. Samples from the farm are the two at the right; the two samples at left are better soil with substantial organic matter. At the time of purchase, we could judge by color that the farm had almost no topsoil and had been eroded to deep sub-soils and at places even to bedrock. We call those worst spots “hell holes”. Today most of the farm is unrecognizable thanks to the success of many of our experiments. Take a look at the farmhouse now!